Lauren Alexander was inspired to start Canine Champions for Veterans when her close veteran friend committed suicide. Her friend had served three tours, and after returning home was diagnosed with post-traumatic stress disorder (PTSD). Lauren later discovered that when veterans who suffer from PTSD have a trained service animal, the risk of suicide decreases drastically. That’s when she was moved to work on a solution that could make a real difference. After her own battle with PTSD and TBI, Lauren could relate to those struggling with similar issues allowing a better understanding of the daily struggle. Her goal is to help all veterans who suffer from certain diseases and disorders, by providing them with a service dog. 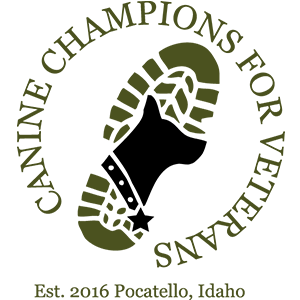 Lauren’s vision for Canine Champions for Veterans is to provide as many veterans as possible with specially trained service dogs. She has sought counsel from veteran organizations to fully understand the needs of veterans and gain insight on the training that service dogs require to assist the veterans with whom they are paired. Lauren who currently resides in Pocatello, Idaho studied Accounting and Business Administration at BYU-I and WGU. After working as SVP of Lender Management, overseeing a variety of Lending Platforms, she has transitioned into being the Executive Director at Canine Champions for Veterans. Mr. Villarreal has more than thirty years of corporate executive mortgage banking experience, developing, managing and directing multiple national privately and publicly held residential lending platforms. Mr. Villarreal has also served in an advisory capacity to various municipal, state and Federal agencies on residential housing finance and community development project areas. Prior to his mortgage industry experience Mr. Villarreal served as Deputy Mayor to Los Angeles Mayor Tom Bradley and is a graduate of the Harvard University Graduate School of Business and Harvard Law School Trade Union Program and received his B.A. in Business Administration from California State University, Los Angeles. Mr. Villarreal currently serves as the Chief Administrative Officer of Affinity Partnerships, LLC and has been engaged to oversee corporate and business development opportunities on a national basis. Mr. Villarreal currently serves as a Board member of Canine Champions for Veterans and is tasked with assisting in the development of the nonprofit and its resources for national expansion and capital objectives. John Alexander is the founder and CEO at Affinity Partnerships, LLC. Born in the USVI, John moved stateside and eventually received an MBA from Idaho State University. Mr. Alexander has served in a number of senior management positions before being recruited to launch a technology startup company in the healthcare industry. Following this venture, Mr. Alexander launched two technology companies dedicated to serving the mortgage industry. He has remained and served in the technology lending space for more than 15 years and eventually launched his own enterprise which is dedicated to ensuring consumers have access to quality lending products and allows consumers to obtain the service they deserve. Mr. Alexander’s philosophy is, “When we provide value and superior service, everyone wins.” This philosophy has been brought into his role serving as a Board Member for Canine Champions for Veterans. John is committed to continuing the CC4V mission to provide military veterans service dogs that are not only trained to their veteran’s individual needs but at the highest service dog standards. Mr. Alexander comes from a family with many military ties and is passionate about getting our service men and women the assistance they need. As a child, Cesar Salgado, knew that being in the military was something that he wanted to do. He was the kid in grade school that would tell his friends and his teachers that he was going to be a soldier when he grew up. Well, on September 11th, 2001, after the attack on the World Trade Centers, he knew that he needed to join the military. Still 16 years old, he was too young to enroll, so he enlisted one year later in the Idaho Army National Guard. Cesar served one tour in Iraq from 2004 – 2005 and was honorably discharged in 2010. Cesar studied at Brigham Young University – Idaho and graduated with a Bachelor’s of Science in Healthcare Administration with an emphasis in Human Resource Management. Cesar moved to Pocatello, Idaho in 2013 when he took a job with Affinity Partnerships, LLC. Serving as a board member for CC4V is a great privilege for him as he has seen the impact that PTSD has on returning soldiers. Cesar also serves as a member of the Pocatello, Idaho Airport Board as well as the Chair of the Chamber of Commerce Education Committee.